MARYLAND (November 15, 2016) – The grassroots Maker Movement has, and continues to, impact entrepreneurship, education, economic and workforce development, manufacturing, community revitalization and technology inclusion in the U.S. To build upon existing efforts and to continue to grow the coalition of diverse organizations supporting the maker community, we are proud to announce the creation of an independent non-profit called Nation of Makers. The organization will serve and represent a wide variety of spaces, events, and institutions serving makers, including non-profit organizations, museums, libraries, science centers, educational institutions, foundations and for-profit companies. Nation of Makers is working with leaders from the maker community in all 50 states and has received more than 300 letters of support from hackerspaces, makerspaces, companies, libraries, local government and economic development agencies across the U.S. who have already experienced the positive impact of the Maker Movement locally, and are committed to continuing to foster the growth and inclusivity of the maker community. In honor of Global Entrepreneurship Week USA, Nation of Makers celebrates the entrepreneurship represented by the American maker community. Chicago, IL, where makers from the broader Chicago community are prototyping everything from energy storage devices and wearable electronics to food packaging and furniture at The Polsky Center for Entrepreneurship and Innovation at the University of Chicago. Anchorage, AK, where the MAKE Partnership is matching federal dollars to support trainings and workshops hosted by the Anchorage Makerspace that are geared towards manufacturing start-ups and maker entrepreneurs. Macon, GA, where SparkMacon is empowering entrepreneurs to launch businesses in the broader Macon-Bibb county. Brookings, SD, where Brookings Economic Development Corporation has opened Brookings Area Makerspace located at South Dakota State University, a shared workshop and creative space open to students, faculty and community members. Kingsport, TN, where the Kingsport Chamber of Commerce is supporting and celebrating the creation of a new makerspace at the Kingsport Public Library. Founding Board Members of Nation of Makers include makers Harley DuBois, co-founder of Burning Man, Pamela Jennings, Professor for Innovation and Entrepreneurship at Winston-Salem State University, Adam Savage, head of Tested.com, and Stephanie Santoso, former White House Senior Advisor for Making. 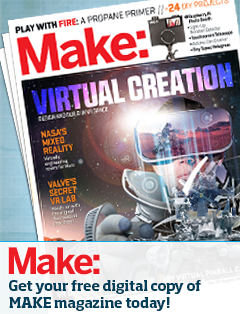 Nation of Makers will support the full range of organizations that impact makers by encouraging connections, broadly sharing resources, facilitating funding opportunities, engaging in policy development, and advocating for the Maker Movement. The organization will help maker organizations amplify the passion, innovation, creativity, and diversity of the maker community, and maximize both its local and global impact. 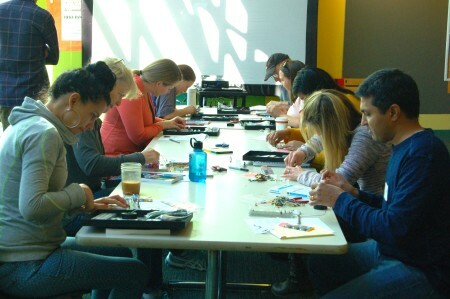 Under the supervision of the MakerSPACE Manager, the MakerSPACE Educator will be responsible for delivering youth, family, and adult ‘maker’ programs connected to the Museum’s collections. The MakerSPACE Educator will also assist in developing innovative and experimental uses of the MakerSPACE in connection to the whole Museum. Assist the Museum’s education department in designing and planning creative hands-on ‘maker’ lessons and programs for children, families, and adults. Welcome and engage visitors to the MakerSPACE including facilitating drop-in activities and hands-on interactives. Lead formal and informal program and activities in the Museum’s MakerSPACE, including drop-in activities, community events, workshops, and school programs. Conduct research on the museum’s collections, exhibitions and MakerSPACE applications. Document projects using photography, video and writing. Work with the Director of Interpretation and Evaluation to evaluate and assess maker activities using provided observational rubrics and structured formal and informal interviews. Facilitate the operation of tools and maintain a safe environment for visitors. Maintain tools in proper working and safe condition including Mill, lathe, CNC Router, Laser cutter, 3D printers and more. Keep up-to-date inventory or supplies and materials and maintain organization of inventory. Working toward or holding a Bachelor’s Degree in education, art, technology or related field. Knowledge of art, science, technology, and computer science. One or more years’ experience working with children in an educational setting, i.e., school teacher, enrichment program, after-school programs, and summer camp. Familiarity with project-based learning and child development. Familiarity with specialized MakerSPACE equipment, like 3D printers, computer programming and Arduino microcontrollers. How are you celebrating the National Week of Making? The same American spirit of innovation and entrepreneurship that has steered our Nation through the industrial and digital revolutions — and led our people to explore the depths of the oceans and the distant planets in our solar system — has enabled us to reimagine our world through new ideas and discoveries. Since our earliest days, makers, artists, and inventors have driven our economy and transformed how we live by taking risks, collaborating, and drawing on their talents and imaginations to make our Nation more dynamic and interconnected. During National Week of Making, we recommit to sparking the creative confidence of all Americans and to giving them the skills, mentors, and resources they need to harness their passion and tackle some of our planet’s greatest challenges. Today, Americans of all ages have the ability to connect and showcase their creativity through a growing maker movement. Technologies like 3D printing and desktop machine tools are rapidly lowering the costs of production; additional sources of capital such as crowdfunding are reducing barriers to getting started; and the democratization of technology is empowering more makers, helping to boost entrepreneurship and stimulate American manufacturing. Over the last 6 years, we have added over 800,000 manufacturing jobs and introduced next-generation manufacturing hubs. Just as the personal computer and the Internet transformed our Nation over the last several decades, these new opportunities can inspire the next generation of students, innovators, and entrepreneurs to carry forward our legacy of ingenuity. In 2014, I launched the Nation of Makers initiative to ensure more Americans of all ages and backgrounds have greater opportunities to design, build, and manufacture. My Administration is taking steps to foster “maker mindsets” by promoting skills like creative problem-solving, and to support the development of collaborative maker spaces so aspiring makers and manufacturers can turn their bold ideas into realities. I am proud that so many people across our country have already joined in this effort. Mayors have hosted maker roundtables and town halls; Federal agencies have worked with schools, libraries, recreation centers, and museums to create maker spaces, curricula, and tools to help students learn the design process; and private businesses and other local collaborators have empowered individuals with the entrepreneurial resources and skills they need to launch companies and sell their products. Together we must continue to expand opportunity for generations to come by working to eliminate the digital divide and reduce existing skill and confidence gaps. We must prepare young people for the jobs of the future by equipping them with the analytical skills needed to solve problems and the computer science and hardware development skills required to power our innovation economy. It is critical that we support the types of hands-on science, technology, engineering, and math (STEM) learning experiences — in both formal and informal environments — that students encounter through making, which can help unlock their full potential and ignite their enthusiasm for the careers of tomorrow. That is why we are prioritizing investment in STEM teaching and active learning, expanding access to rigorous STEM courses like computer science, encouraging more opportunities in communities of greatest need, and working to get underrepresented students, including women and minorities, involved to increase diversity in STEM fields. Across our country, Americans are attending all types of maker events and workshops — from studios in small towns to the streets of our Nation’s capital — to share their incredible inventions and ideas with others and to inspire all of us to join in the creative process. As we celebrate the power of American ingenuity, I invite communities to build on this progress by encouraging citizens to be creators and by working together to ensure that spaces for making are available anywhere Americans live, work, play, and learn. This week, let us turn today’s sketches and dreams into tomorrow’s “Made in America” labels, and let us embrace the audacious spirit of human curiosity that is embedded in our DNA. NOW, THEREFORE, I, BARACK OBAMA, President of the United States of America, by virtue of the authority vested in me by the Constitution and the laws of the United States, do hereby proclaim June 17 through June 23, 2016, as National Week of Making. I call upon all Americans to observe this week with programs, ceremonies, celebrations, and activities that encourage a new generation of makers and manufacturers to share their talents, solutions, and skills. IN WITNESS WHEREOF, I have hereunto set my hand this sixteenth day of June, in the year of our Lord two thousand sixteen, and of the Independence of the United States of America the two hundred and fortieth. Our next Meetup is all about food and starting a food business. We are also going to have displays from Newark’s own Food Entrepreneurs. Come meet your local Wine Makers, Sausage Makers, Nuts Distributors, Ice Cream Makers and world-class baked goods such as the classic Joeys Black and White cookie. These are all companies located right here in Newark and are thriving in the food industry. As a special treat, we invited the Taqueria Autentica food tuck to the Museum grounds to serve us awesome refreshments directly from their truck. All food will be free of charge for the first 30 members who sign up. Finally,Makerhoods.org will be describing the new development of affordable live/work community coming to Newark. Find out how to qualify for this unique development which dedicates a portion of its space to local entrepreneurs who need affordable shop space or a store front. National Maker Faire, June 18-19th!